I just placed an order with thredUp and thought I’d share my experience. First, I’ve mentioned thredUP before. I love the concept – it’s like going to a great consignment store but you go through the merchandise online instead of searching through racks. I like supporting local shops, but shopping online is a convenient, nice option. 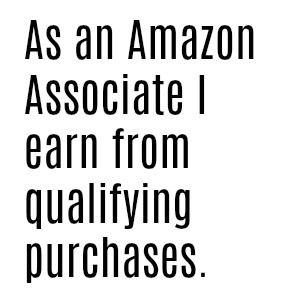 Especially if you’re looking for a specific item or don’t have any good stores nearby. Why shop secondhand? You aren’t contributing to waste streams caused by the fashion industry, and you’ll save a lot of money. Babies and kids especially wear their clothing for such a short time, it makes a lot of sense to shop this way. I tend to like to try things on for myself, but it’s easy to shop for my daughter online. 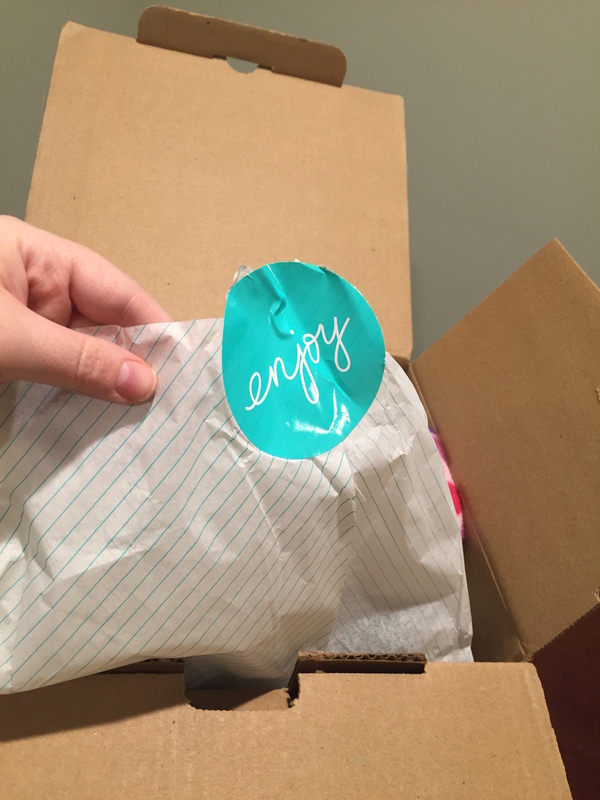 Spoiler: after this great experience with thredUp, though, I will definitely consider shopping for myself on their site. 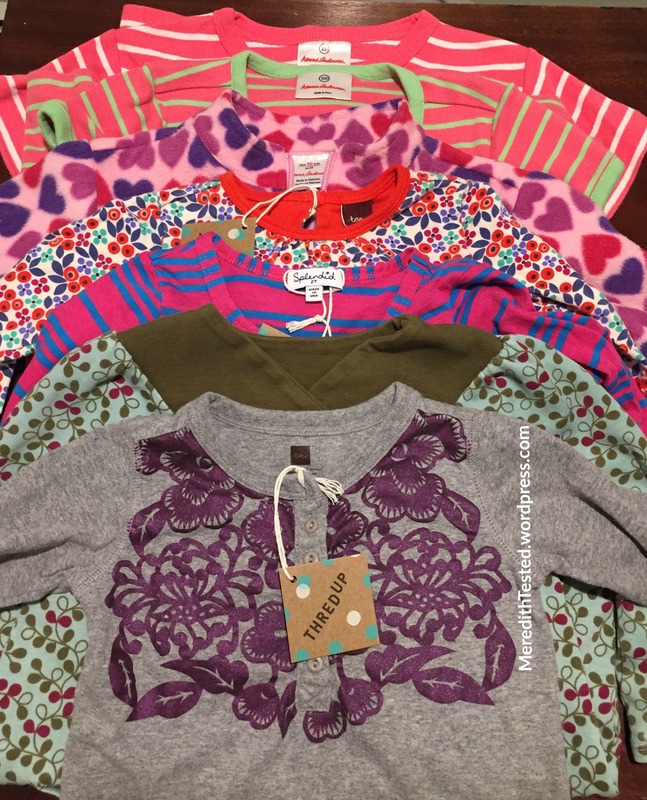 thredUP offers clothing and accessories for Women and Children but I ordered items only for my (one year old) daughter this time. She’s growing out of things left and right! I’ve gone to a few local consignment and secondhand stores in the past month or so and come up short. They just didn’t have what I needed or wanted. …thredUp to the rescue! Here’s what the box looks like. All of the packaging is easily recyclable or reusable (I will be reusing everything), but this ‘enjoy’ sticker is landfill waste. However, I think it’s cute so I kept it with the tissue paper to reuse for a gift or some other use. The only thing I’d change is that every item came with a thredUp cardboard tag. No plastic, which is great! But I don’t think the tags are necessary. They went straight into the recycling (and compost, for the thread) bin. Since the tags weren’t labeled with anything but the thredUP logo, I think they can definitely be left off. I’m not sure if they automatically add the tags but for my next order (yes, I’ll be ordering from thredUP again for sure!) I will see if they will leave off the tags. I think it’s clear I favored a few specific, higher-end brands in this order. I know they hold up and therefore they would be more likely to be in good condition and will continue to work well for my daughter. I ended up with a t-shirt, t-shirt dress and half-zip fleece from Hanna Andersson, three long-sleeve shirts from Tea and one striped dress from Splendid. Some of the items won’t fit her right away but she’s already worn the gray Tea henley and the Splendid dress several times. 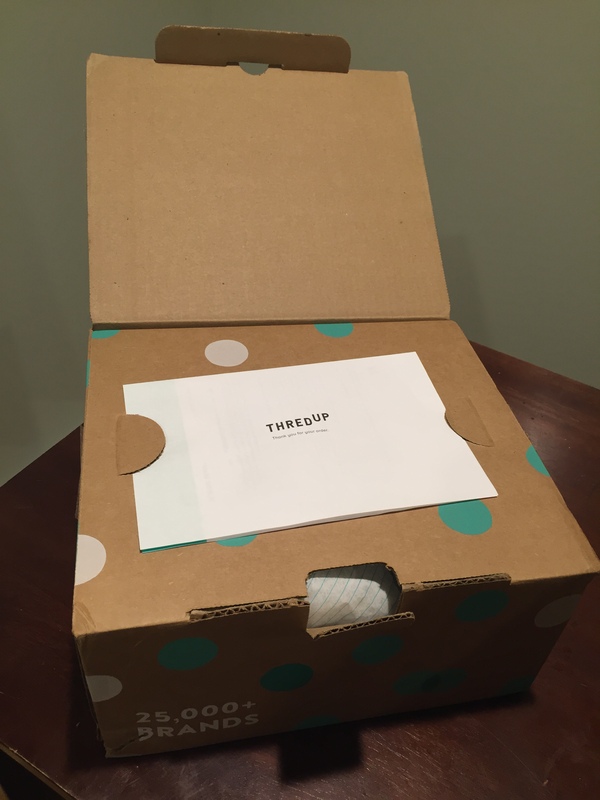 thredUP is giving you $20 off your first order if you sign up here. You can also send in your good condition clothing for resale. Make $ and then spend it on cool stuff, all without contributing to waste streams. Yay! Other online consignment stores I recommend that offer baby and kids clothes are Schoola, Little White Sneakers and Kidizen. I also like looking on eBay, but only for things I know specifically that I want. When my daughter was just a few months old I purchased a set of 4 Hanna Andersson pajamas from eBay for $40. They were in beautiful condition and my daughter wore them for a long time. Do you shop secondhand at local stores or online? What has your experience been?